Good morning! To my fellow Canadians: I hope you're enjoying your long weekend! To everyone else: Haha suckers I hope your regular weekend is going well too! ;) I'm behind in posting which may be a good thing because I now have three posts ready to go for this week. I was really liking the flowers from my previous manicure, Wildflowers, so I decided to try out those little flowers again. This time I arranged them in a more structured pattern, framing my nails almost like the border nail trend. I chose to go for a single accent nail in a happy, shimmery yellow that added just the right punch of brightness to the manicure. On the accent finger I used American Apparel Manila with Color Club Daisy Does It (how fitting!) on top. For the rest of the nails I used American Apparel California Trooper. With a small brush I painted on the petals with OPI Alpine Snow and the leaves with OPI Green-wich Village. 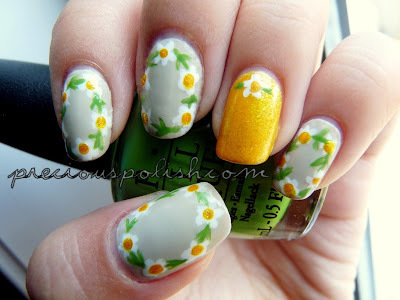 I used a dotting tool and the same yellow combo for the centers of the daisies. New favorite preciouspolish mani! I love freehand designs, especially flowers. Definitely trying this one out! I love your flowers! So cute! This is so bright and cheerful and warm and cute and...love it, Brittney! Haha, you caught that, eh? ;) Thank you!